Works by: (January) Emcee C.M. Master of None; (February) Glen Einbinder; (March) Rafael Hidalgo Múgica; (April) Naomi Miller; (May) Chad Stayrook; (June) Michelle Rosenberg and Howard Huang; (July) Hope Ginsburg; (August) eteam; (September) Paul Kennedy; (October) Adrienne Garbini; (November) Travis LeRoy Southworth; (December) Rick Myers. 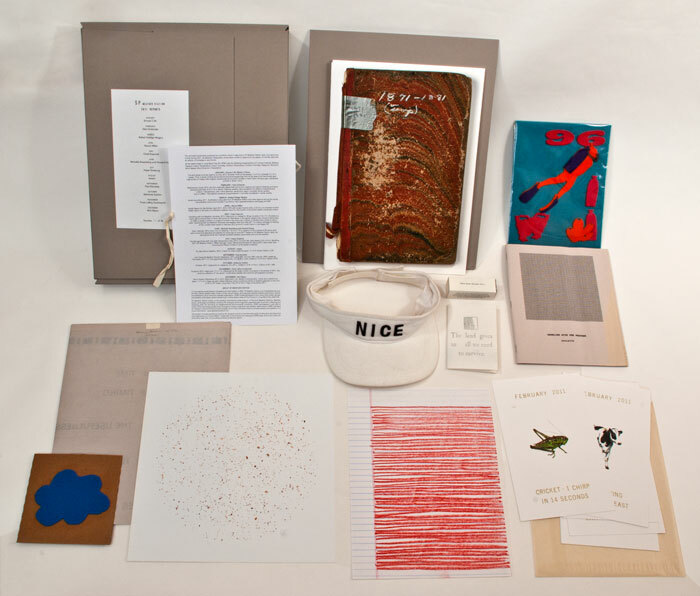 The 2011 portfolio was selected to be included in the International Print Center New York’s ‘New Prints/2013 Winter‘ exhibition. Box dimensions: 15 x 12 ½ x 2 in. Mirror System (December 2011), 2012. Black paint, vial, residue of precipitation, cotton wool, plastic box, label, 1 x 1 x 3 in. 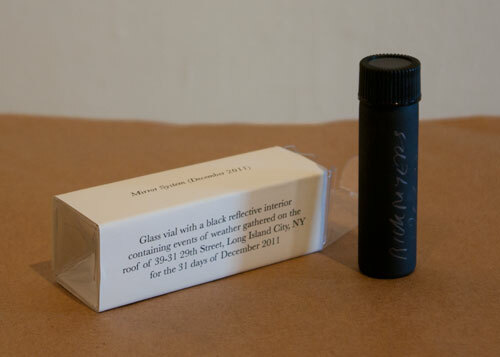 Glass vial with a black reflective interior containing events of weather gathered on the roof of 39-31 29th Street, Long Island City, NY for the 31 days of December 2011. Sunspots, 2012. Inkjet print, 11 x 11 in. 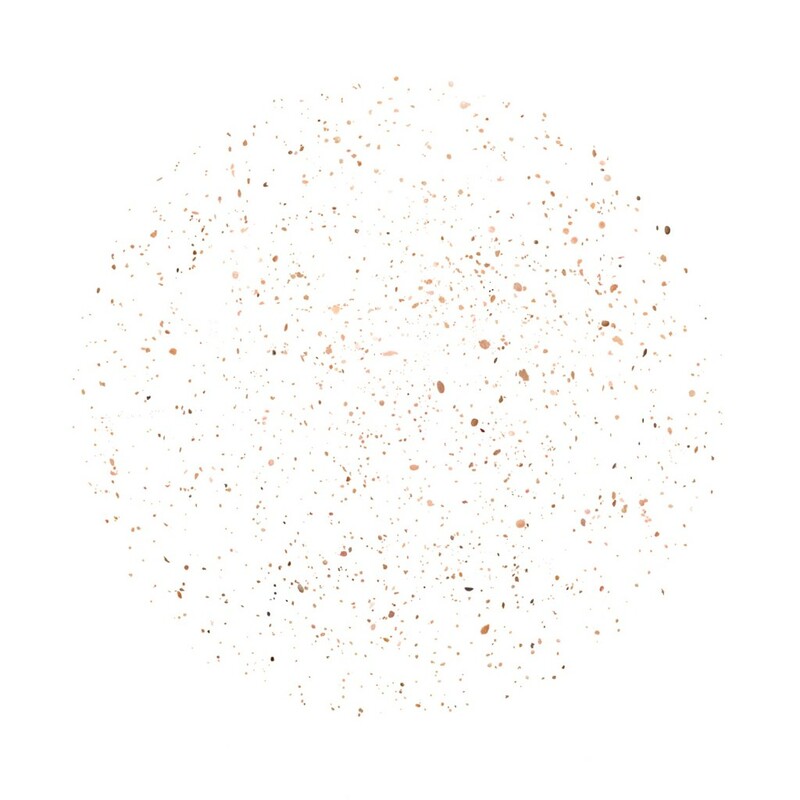 Influenced by the large number of sunspots in November of 2011, this work is a collection of “sun spots” or blemishes digitally removed from photographic portraits. October, 2011. 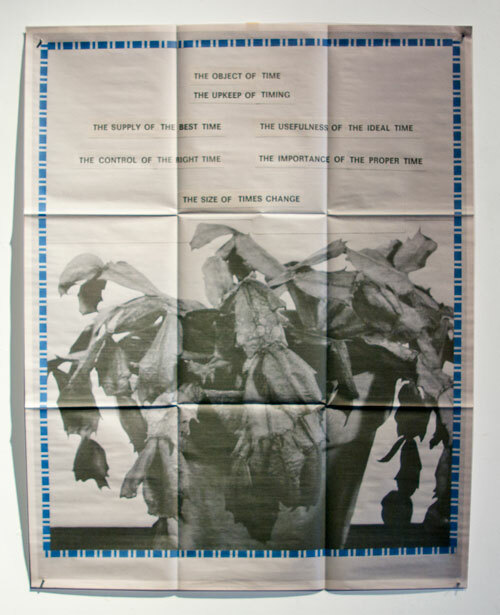 Inkjet print on newsprint, 37 x 29 in., folded to 12 ¾ x 9 ¼ in., Edition of 30 + 4AP. 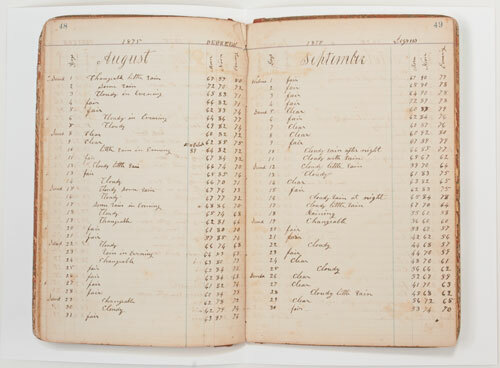 John Davault’s Weather Diaries: September 1871–June 1881 and July 1881–January 1896, Leesburg, Tennessee, 2011–12. Two pigmented inkjet prints, 13 x 18 ¼ in. 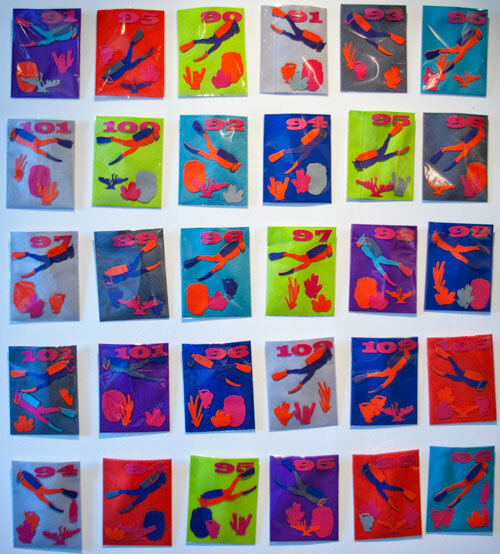 each, folded to 13 x 9 1/8 in. Edition of 50. No day without weather, 2012. 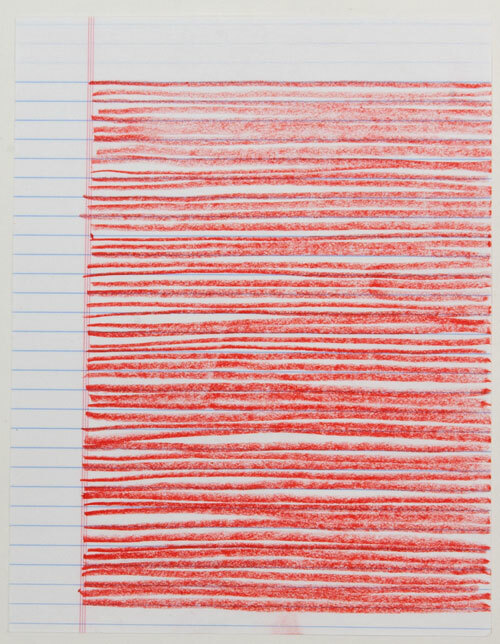 Crayon on ruled notebook paper, 11 x 8 ½ inches, Edition of 30. 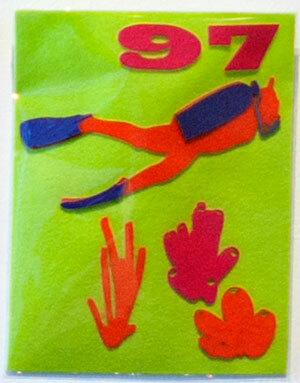 Toy Sponge Divers with July High Temperature Data, 2012. 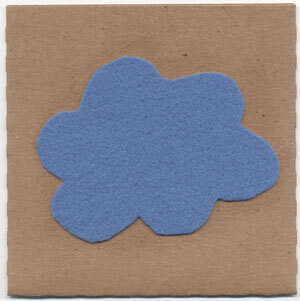 Cut wool felt, cello sleeve, 8 ¼ x 6 ½ in. Recalling 2011 SP Weather Station “Water Sponge” event. Rehearsing fantasies for Spring 2012 open water dive. Honoring the Phylum Porifera in all its sessile mutability. Visor Calendar, 2012. 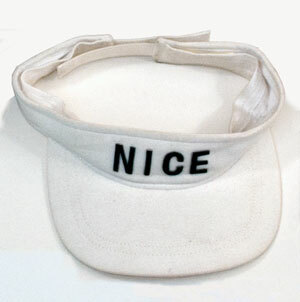 Visor, iron-on lettering, 7 ¼ x 6 x 1 ½ in. (approx.) 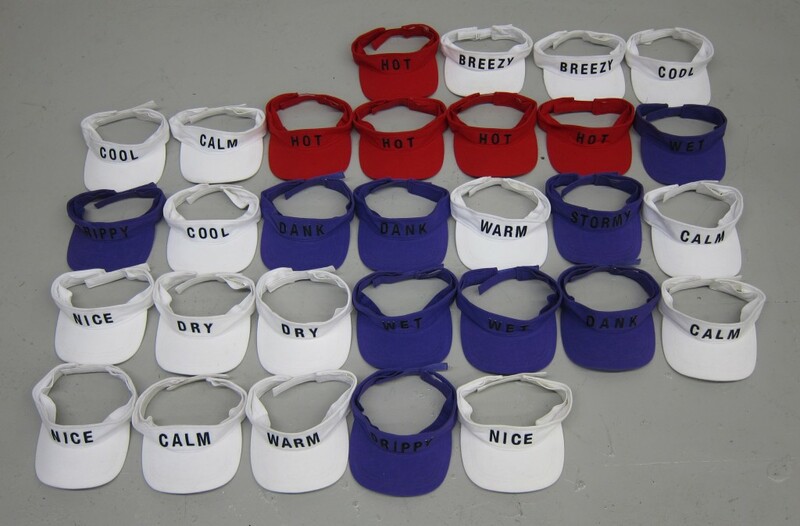 From a series of 30 visors, each with a word that describes the weather for every day of June 2011. Based on SP Weather Station data, the descriptive words also highlight parallels between personality traits and the weather. 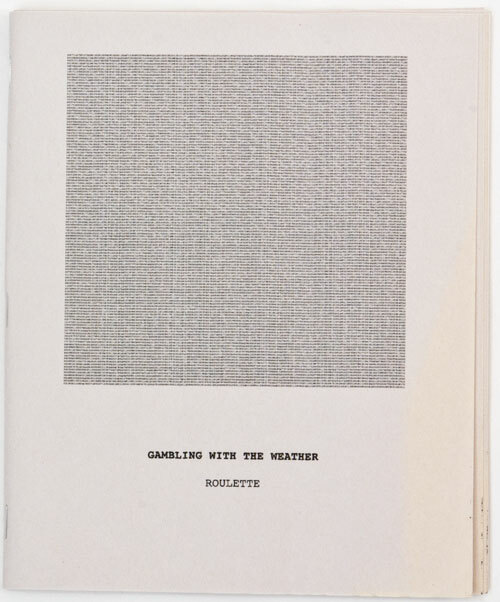 Gambling with the Weather: Roulette, 2012. 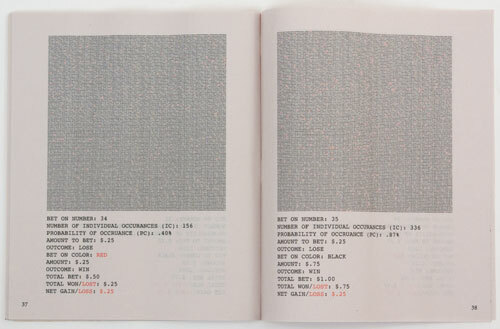 Inkjet print on newsprint, 48 pp. 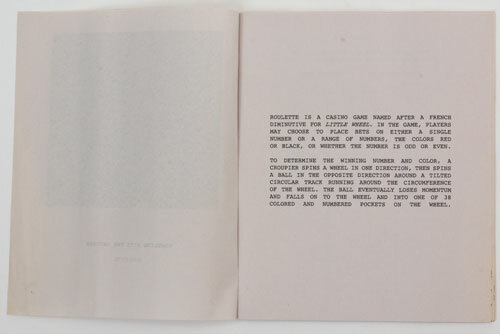 booklet, 8 ½ x 7 in. Roulette is a casino game named after a French diminutive for little wheel. In the game, players may choose to place bets on either a single number or a range of numbers, the colors red or black, or whether the number is odd or even. Gambling with the Weather: Roulette uses weather data from May 2011 to create a strategy for betting at the roulette table tested in February 2012 at the El Cortez Casino in Las Vegas, NV. Health Report for My Mother, April 2011, 2012. 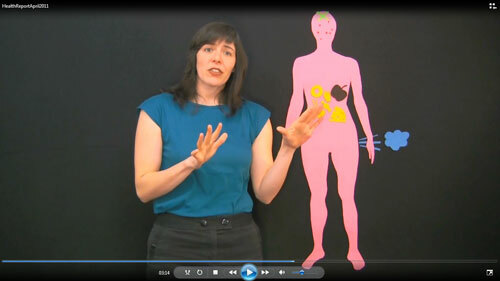 DVD with single channel video, 5:33 min. 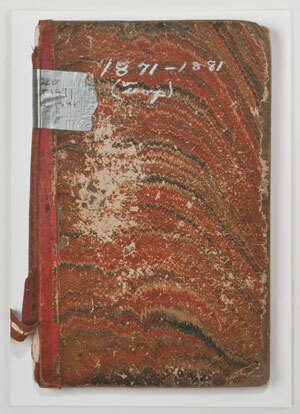 A complete month’s health report in the style of a television weather report for the benefit of the artist’s health-concerned mother. 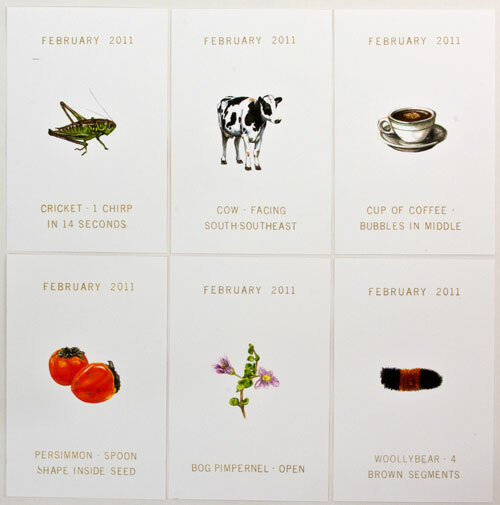 cricket = temperature; cow = wind direction, persimmon seed = snowfall, winter quality; cup of coffee = atmospheric pressure; bog pimpernel = humidity; woollybear = winter quality. January 2011 – Emcee C.M. 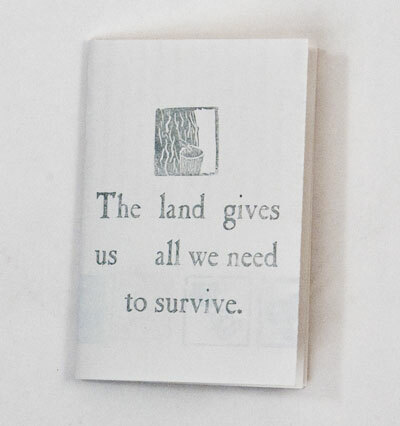 The land gives us all we need to survive, 2012. 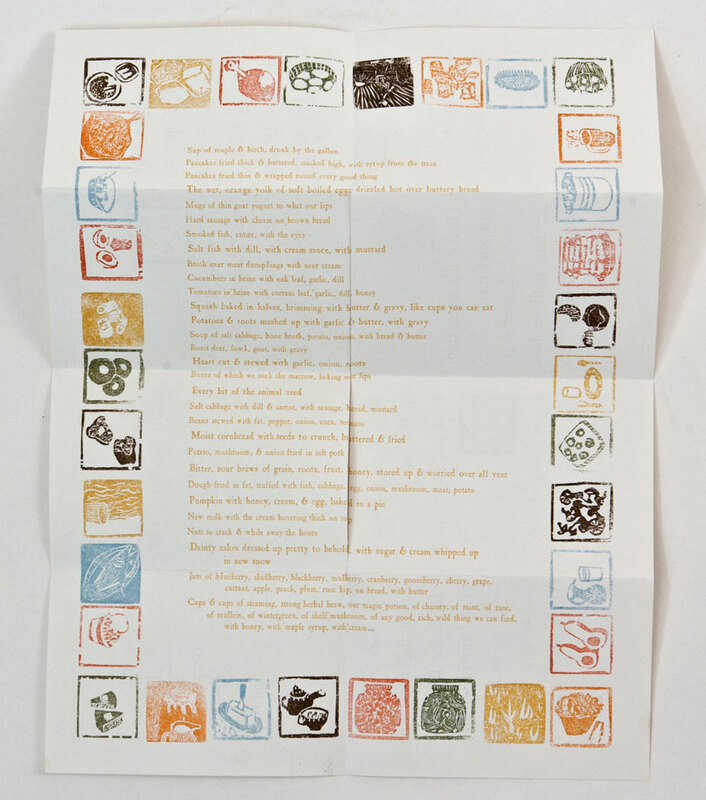 Booklet / fold-out broadside, 3 x 4 ½ in. (closed); 9 x 12 in. (open). From a series of thirty-six woodcuts and wood engravings from all six sides of six handmade type high blocks of maple, with original narrative text & list poem handset in lead Caslon Antique type, letterpress printed in seven colors.